It is deja vu so to speak. It is yet another World Cup. And yet another instance when the Indian team goes into cricket's flagship competition as the firm favourite to lift the title. In the past the favourites' tag has had a drastic, rather disastrous consequence in terms of results and Team India has more often than not flattered to deceive. However, as in case of other things in our country, hopefloats eternally as regards our cricket as well. There are many who believe this Indian side is capable of repeating the feat that Kapil Dev's team last achieved in 1983 and winning the World Cup a second time. To be fair, on this occasion, their belief seems justified. For the Indian team has in the past three years or so achieved results that have exceeded all expectations. It is this very fact, besides the home advantage, that hasa gain made Team India frontrunners for the world title. And the team is ready to deliver on this occasion, if captain Mahindra Singh Dhoni is to be believed. "I think the last two years' performance do contribute a lot (to the favourites' tag)," admits Dhoni, adding, "During that time we have done well wherever we have played, and given consistent performances. "I think that is one of the main reasons why we are said to be one of the favourites. And of course the home condition also adds to it." That the sub-continental conditions will help Dhoni and his men considerably is understood. But the captain has an opinion regarding the same. "Knowing the conditions well is very important. And from what we have seen, if the wicket misbehaves that is, it turns the sub-continental teams are assumed to negotiate it better than some other teams," he explains. "Also the quality of spinners the sub-continental sides have is slightly better," he adds, before elaborating on the significant role the bowlers -- slow and fast -- have to play in the tournament. "We will rely on the spinners more because of the conditions. 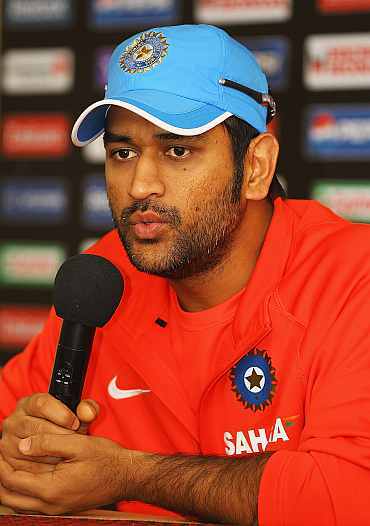 The wickets are going to turn," says Dhoni, adding, "But it doesn't mean that the fast bowlers will have no role to play. "I think it is a tournament where reverse swing will be a crucial factor and this is where the fast bowlers have to contribute, especially in the second powerplay and the slog overs," he added. While bowling seems to pose a few questions as far as Team India is concerned, the batting seems to be a more settled department. "It is good to have so many playing vying for the same batting positions," observes Dhoni. "But the selection of the team will be made only after assessing the conditions on the given day," he adds. Asked if the team think-tank may at some stage contemplate changing the batting order, Dhoni comes up with an interesting explanation. "Most of our batsmen are floaters," says the captain, adding, "They can bat at any number. "So changing the batting order as per convenience shouldn't be much of a problem." The preceding team -- the Rahul Dravid-led side of 2007 -- was also the favourite going into that event. However, they exited at the first stage. What is the difference between that side and the present one? "I think we are in a better frame of mind now than we were in 2007," reasons Dhoni, adding, "That is the main difference because from the talent point of view I don't see that squad lacking anything. "It was as a good a squad as this one. It is just that we would be playing in conditions that we know better than we did then." Does that mean his team will offer no excuses should they lose earlier than expected? "We never give excuses, be it in the ODIs or the T20 format when we have not done well," says Dhoni, getting quickly into the defensive mode. "However, the reasoning for the loss is often taken as an excuse," he continues, adding, "Therefore, I keep on saying the interpretation of the statement is very important." The Indian captain springs a surprise by declaring that the tournament has begun as far as his side is concerned. "For us the tournament has already started -- with the two warm-up matches against Australia and New Zealand, both of which India won -- and we just need to carry on with the same intensity," explains Dhoni. "And there's no pressure on us as such but an added responsibility that you are supposed to do well," he concludes.